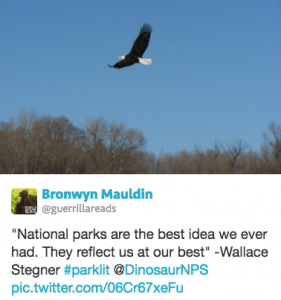 Have you visited a national park lately? Did you read a book while you were there? The National Park Service (NPS) turned 100 years old yesterday! NPS oversees 412 national parks, monuments, battlefields, lakeshores, scenic rivers and trails, and even the White House, covering more than 84 million acres across the U.S. In 2015, more than 307 million people traveled to the parks. Recent reports suggest 2016 visitorship is even bigger. In September I’ll be an Artist in Residence at Mesa Verde National Park in Colorado. Mesa Verde was founded in 1906 and was the first park designated to “preserve the works of man.” There are nearly 5,000 archeological sites in the park, including Cliff Palace and other magnificent cliff dwellings built by the Ancestral Puebloan people, dating back to as early as the sixth century. To celebrate #NPS100 and my upcoming residency, I organized the #ParkLit Hashtag Book Festival that took place last Saturday, August 20. As far as I know, it’s the first book festival ever to take place entirely on a hashtag, and everyone was invited to participate. 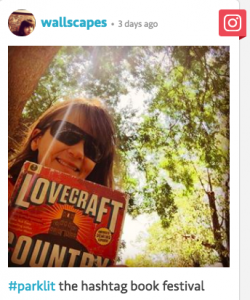 People posted reading-in-the-park selfies, links to favorite books about parks, poetry about parks, blogs inspired by the book festival, and quotes about the parks from authors like Wallace Stegner. Turns out, parks and books owe a lot to each other. Some people credit William Wordsworth, English poet of the Romantic period, with first thinking up the concept of a “national park.” Zen poet and beatnik Gary Snyder was once a park ranger. Author (and former park ranger) Nevada Barr has written 19 mysteries in the Anna Pigeon series, each one set in a different national park. There are more books written by current and former park rangers than you might imagine. There’s even a whole genre of park ranger romance novels. Just like at any book festival we had conversations with terrific authors. I chatted via Twitter with five writers from Florida (Everglades National Park) to Utah (Hovenweep National Monument) to Alaska (Denali National Park and Preserve). Each told me about the relationship between the parks and their writing. For all of them, parks and nature are places both to write and to find inspiration. They talked about the stories and poetry they find in the parks. Parks, they told me, embody the essence of story. They have characters and plot, and they are rich with setting. To spend time in a park is to constantly wonder what might happen next. The authors I chatted with also offered recommendations of books that could keep me reading for years. Together, they constitute a kind of travelogue, doing what books to best, letting you visit places you can’t always get to in person. They named writers like Esther Belin, Hampton Sides, Joan Didion, Natalie Diaz, Edward Abbey, Archie Carr and Marjorie Stoneman Douglas. Mesa Verde is in the heart of a region rich with nature, culture and history. It also has lessons to teach us about adapting to climate change. During my residency I’ll have an opportunity to explore Mesa Verde’s stories through my own writing practice. Then on Friday, September 16, I’ll host a free writing workshop in the park that is open to anyone at any level of writing skill. Many national parks have artist in residence programs, and they aren’t limited to writers. Learn more about Artist in Residence programs at the national parks. If you can’t make it to the park you can still stop by the page for the #ParkLit Hashtag Book Festival, read what the authors said, get some reading recommendations, and learn more about why books and parks go together like… books and parks. Bronwyn Mauldin is the author of the novel Love Songs of the Revolution, and the short story collection The Streetwise Cycle. Her work has appeared in the Akashic Books "Mondays Are Murder" series, and in The Coffin Factory, Literature for Life, Necessary Fiction, and other places. She is the creator of GuerrillaReads, the online video literary magazine. In September 2016 she will be an artist in residence at Mesa Verde National Park. You can find my on my website or @guerrillareads.